The University of Texas Pan American (UTPA) encourages students to “Prepare, Discover, Transform”. In this regard, the University is wildly successful. It is consistently ranked among the top 100 best US colleges for Hispanic students, and is 2nd in the nation for the number of bachelor’s degrees awarded. All that success is contagious – UTPA attracts talented academics from around the world to research and teach in its Edinburg, TX campus. But this success comes at a price: The University Infrastructure, which was adequate for a small regional college, now struggled to support the demands of the increased volume of a growing regional University. 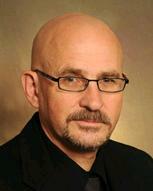 In his first year as President of the UTPA, Dr. Robert Nelsen recognized this challenge right away. He had a transformative vision for his University which required improved responsiveness in administrative functions, without any increase in cost. The university had focused on improving the quality of its curriculum and educational resources without giving much thought to the transactional business functions. Until now, they simply had not been a priority. For him to accomplish his vision, Dr. Nelsen simply could not ask for more money from the UT program, he had to find a way to get more out of the resources he already had. Dr. Nelsen was familiar with the concept of LEAN at an enterprise level, and suspected he could achieve his goals through the identification and elimination of waste and improvement in the flow of tasks. He discussed this idea with an industry colleague, George Reynolds, a pioneer in developing lean transactional processes and formerly employed by Northrop Grumman Corporation as their Director of University Programs and Process Improvement. George agreed to provide some training and assistance to UTPA. After some discussion, both parties agreed to look at the procurement process at UTPA, and establish it as a test case to see if the lean methodology would “work” in an academic environment, and also to see whether it was possible to train UTPA staff to use lean methodology, so that they could continue to make improvements after the Northrop Grumman team left. In October, 2010, George brought along a Master Black Belt to help observe the procurement process and facilitate a three day Value Stream Mapping event, focused primarily on the procurement process. A VSM, or “Value Stream Map” is a visual representation of a process that is intended to deliver value to a customer. It provides a structured approach for “seeing” the sequence of events required to deliver customer value and defines how each step in the process impacts what the customer values. The VSM shows how the processes link together in a ‘value chain’ and the map provides a way of “seeing” opportunities to minimize waste and improve process performance. The real strength of the VSM approach is in gathering people from different disciplines to see and talk about the flow of processes in a common language, and at a common contextual level. Once the problems are seen in the context of the overall process flow, their impact on performance can be measured, and countermeasures/improvements can be made. This effort using the VSM culminates in designing a detailed Future State Plan and vision to move forward. The UTPA team went right to work, embracing the idea that they had control of their own destiny. The team quickly outlined the process they intended to improve (2), connecting each process step and output to a customer. This outline framed the starting and stopping points for a more detailed look at the procurement process, which the team mapped in great detail (3). With this detailed view of the process, the team was able to identify the “friction points” in the process – the things that got in the way and slowed things down. Training / Insufficient Knowledge – the people involved with the process just were not sure what to do. 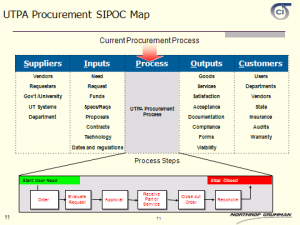 Infrastructure – The tools (hardware and software) were not adequate to support the procurement needs. The final day of the three- day VSM process was used to synthesize the process improvement ideas into specific actions (“WHO is going to do WHAT by WHEN”). This involved a lot of discussion, trade-offs, negotiation and estimation of costs and impacts, and is always much more intensive than it sounds. 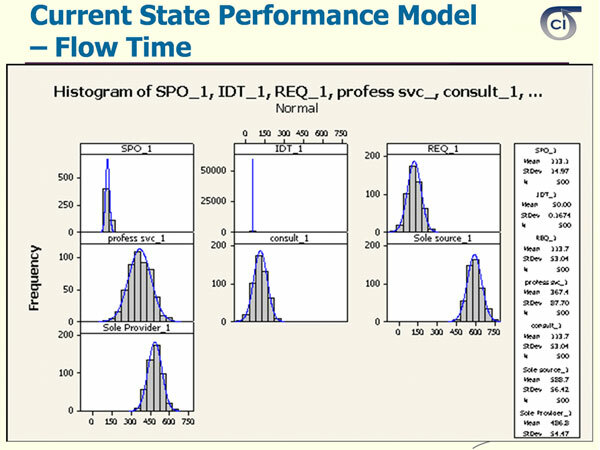 With each improvement idea, the team estimated the relative impact the “fix” would have on the overall procurement lead time, and a “future state” Monte Carlo simulation was used to model the overall expected impact on performance. The ability to visually model the impact allowed the team to focus on solutions that involved the most “bang for the buck”. At the end of the third day, the UTPA team was exhausted, but satisfied. They had addressed the specific changes they needed to make to the process, each dealing with manageable actions that are summarized below. Handoffs – Minimize the “in box / out box” waits from handing tasks back and forth to different functional organizations. Maximize the amount of work that can be accomplished at one time by each group. The impact of improvement impact was re-modeled using the Monte Carlo approach, and the “Future State” process time was compared to the Current State. 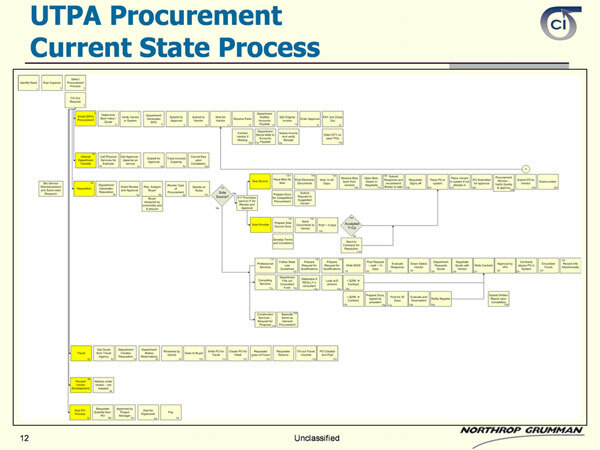 Improvements to specific process paths were modeled to be ~ 30% (5), except for the Sole Provider Procurement process, which involved improvements that were out of scope for this initial effort. At each step of the process, the facilitator instructed the team about the theories of lean and continuous improvement that were used. He further taught the practitioners how to created and model their own maps, so they could continue to develop their improvement skills without the need to bring in expensive consultants each time. As highly engaged and intelligent groups often do, they embraced the concepts of the process improvement paradigm, and diligently went off and worked the action items. Within a few months, the team had met the expectations of the modeled performance, but saw the opportunity to do even more. They met with smaller teams, and continued the process of problem identification and problem resolution. Without increasing costs or headcount, they were able to bring the lead time for the procurement process down by almost 50%! What happened next was even better – the UTPA staff became encouraged by the success they experienced in the procurement process, and started to map other elements of the administrative and transactional processes. While not every process was capable of a 50% reduction in lead time, each process was capable of being made better without adding more cost or resources. In fact, there was no magic to the improvement effort itself, it was the result of key stakeholders paying attention to what was happening, assessing the current state information, identifying the problems and simply deciding to do things a little better. We call this type of change “continuous improvement”, and it enables us to get control of the seemingly chaotic things that make it difficult for us to succeed at work.